When the gift box of aromatherapy pet care products from New York-based Gerrard Larriett arrived for me to test, I did a happy dance. Everything about them is beautiful. And they aren’t just for pets. 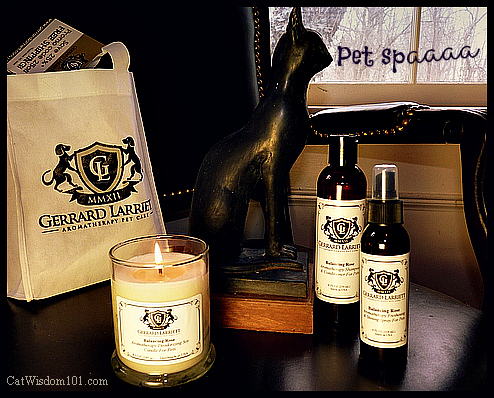 The Gerrard Larriett Aromatherapy Pet Care system includes pet shampoo & conditioner, pet freshening and shining spray and handmade deodorizing soy candles for the home. Odin my feline product tester deferred to Bast, our Egyptian cat goddess sculpture. Cats, dogs and lit candles should never be left unsupervised. You may not know but I taught aromatherapy for many years and I love how natural scents can affect body/mind and spirit. The first thing I did was light the Balancing Rose candle. A few minutes later, the relaxing scent of roses lifted my winter weary heart. The unique hand-poured soy candles have a whopping 58-hour burning time and are available in three signature aromatherapy scents: Balancing Rose, Happy Jasmine, and Relaxing Wildwoods. Unlike dogs, cats have less need for bathing but I like that the Gerrard Larriett shampoo & conditioners contain Aloe Vera and Oat, known to naturally prevent skin irritation and to rehydrate sensitive, dry skin. They come in the three signature scents as does the Freshening and Shining Spray with Lanolin naturally rehydrates sensitive, dry skin. But wait! If the custom-formulated moisturizing agents leave coats fragrant and shiny in between baths for dogs but is not recommended for cats (cats don’t need scent) what about humans? I spritzed it on the back of my hand and had an Aha moment. It’s purrfect for dry skin on humans! Close your eyes, spritz the top of your head for a scent-cloud banishing bad moods. The next time I fly, I’m going to pour some in a travel container for instant mist of hydration heaven. Disclaimer:I received product samples but the views here are my own. Please mention in your comment where you shared. We’re purring to announce the two winners of lasts week’s Pawalla giveaway are Paulette Smith and Katie. Congratulations! Please look for an email from Layla and Cat Wisdom 101. Oh fabulous to see this range of products. I use essential oils and product daily and my cat love it, especially after I’ve one an aromatherapy massage treatment on a client (I’m s massage therapist and work from home). I often find them curled up on the massage table after the session or a the door of the treatment room breathing in the aroma. Sometimes they even nudge open the door during a session and sleep under the table or in an arm chair – or occasionally join a client on the table! I foster kitties who come in with a variety of issues. These would be great for many of them. Love both my cats but one is really hateful to everyone but me and the other is a nervous wreck because of it; both great cats but a little help is needed 🙂 Thank you! We would love the Relaxing Wildwoods! I also follow Gerrard Larriet on Twitter as @normawatson. Please ignore my double “email subscriber” comment below. I’m not sure why that posted twice. I like Gerrard Larriet on Facebook as Cindy Aiton. Thank you for offering such a wonderful giveaway. I would choose the Happy Jasmine and Relaxing Wildwoods candles. Happy jasmine sounds great! I need to relax from all the intense dreamingz. I learned my lesson about cats and candles over fifteen years ago when I had a kitty stick her tail into a lit candle. Cat hair is highly flamable. I’d love to have my dogs try the rose fragrance aromatherapy products. I would love to win this for my beautiful rescue, Moses. He is a white Persian 🙂 Thank you for the chance! & I followed Gerrard Larriett on Twitter! I liked Gerrard Larriett on FB. I’m a Cat Wisdom 101 subscriber. Thanks for highlighting these interesting products. The design is very elegant! Does they helps make sad Mommy’s whose job is now one feel better? Me Liked on Facebook, me followed on Twitter and Me is so furry sorry we has not been commenting, but me has been reading! Me needs a New secretary! And we just liked Gerrard Larriett’s page! Ooo we want to enter please! We’re moving, so this would be a great thing to have! We liked Gerrard Larriett on Facebook! Glogirly says she would LOVE the candles…especially the Jasmine one. That’s after I told her what I thought about having a bath. ; ) Great giveaway!!! This looks like a pawsome brand! not wanting to enter yet ANOTHER contest (we’re not THAT greedy, altho this collection does look NICE)…just a note hoping that your “winter weary heart” stayed lifted today. according to your FB post, it didn’t sound like all that great of a day. good luck! What a lovely treat for feline and nonfeline! I would love to win the $50.00 certificate. I liked The Gerrard Larriett FB page and I am following them on Twitter. We will pass since any strange smells bother Gracie, but someone sure will enjoy! Happy jasmine for some relaxing time for the kitties. This looks wonderful! That sounds wonderful. I am already a subscriber. Liked their FB page and Twitter page. Shared on FB(sue brandes) and Twitter(@katsrus2003). Thanks for the giveaway. Thanks for mentioning you the product in your Pawalla box! best fishes two everee one N odin, gris, merlin, N domino…oh N mom and dad two…heerez ta a grate week oh end :)!! Looks like some really nice things. We liked and followed on Twitter. We will share on Facebook too. Thanks for doing this. Oh! I Love smells!! – Crepes. I would really like to try the Balancing Rose Aromatherapy Freshening & Shining Spray For Pets. Seems like it would be an awesome product to keep my pets smelling great. I am also signed up for the catwisdom101 newsletter and liked Gerrard Larriet on facebook as well as following Gerrard Larriet on twitter. What an amazing giveaway! Thanks for sharing that. Looks like a fun one to win for you and the cats! Going to check out the page. We would love to win this! 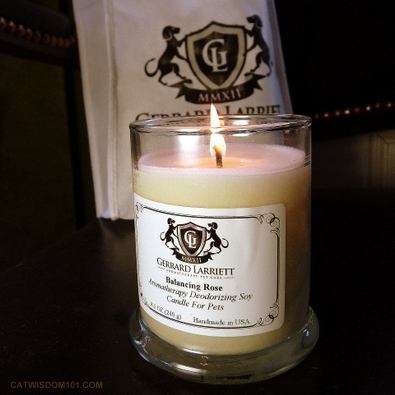 The mom loves candles too…and she’s big on aromatherapy too. I love soy candles and would love to try the other products. I love trying new scents and this sounds absolutely wonderful. Winning would be even better!!! I just recently read about your expertise in aromatherapy. I liked Gerrard Larriett’s page on my Facebook. I never thought of aromatherapy for the animals, bu I am now. 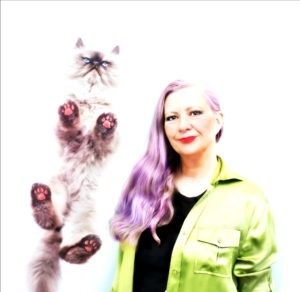 If I was lucky enough to win the Gerrard Larriett $50.00 gift card I would choose the Balancing Rose Aromatherapy Treatment Experience For Pets. I love roses and this would make my cats smell wonderful. The soy candle is a wonderful idea to burn near the litter box when needed. 🙂 The cats would smell wonderful too when they absolutely need a bath. This is a wonderful giveaway and I look forward to trying their products if I am so lucky to win. I shared on Pinterest in the cats album, on Facebook and on Twitter. I am a Gerrard Larriett FB fan: Raine Dawson and a Twitter follower @buzzyngabe, I’m an email subscriber of Cat Wisdom 101, FB fan & twitter follower also. I shared on FB, twitter, Pinterest, and G+ on 3/8 Wonderful giveaway-thank you! I saw these candles recently and thought they looked terrific! The jasmine scent sounds like something I might like.. I’m already a subscriber to your feed but I went and liked and followed too!